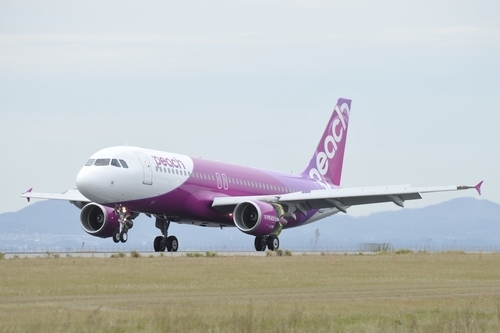 Peach Aviation, Japan's first low-cost carrier based at Kansai International Airport, announced on August 24, 2012, the trial launch of a continuous descent arrival, or continuous descent approach (CDA), scheme during late-night and early-morning hours. It would adopt this method for all aircraft landing at Kansai International Airport from Hong Kong during these low-traffic hours. CDA is a method by which aircraft approach and land at airports, descending continuously from the top of descent, or cruise altitude, and maintaining a proper angle until landing. This procedure eliminates nearly level flight, which normally occurs during the descent phase in a conventional approach, thereby reducing fuel consumption and carbon dioxide (CO2) emissions. An Airbus A320, for example, can reduce 300 to 800 pounds of fuel consumption per landing by adopting CDA.